Around 2 ¼ million people are incarcerated in the United States. Even though prisons are euphemistically labelled correctional facilities very little correction actually occurs. This is supported by the rates of recidivism. About three quarters of prisoners who are released commit crimes and are sent back to prison within 5-years. The lack of actual treatment for the prisoners leaves them ill equipped to engage positively in society either inside or outside of prison. Hence, there is a need for effective treatment programs that help the prisoners while in prison and prepares them for life outside the prison. Contemplative practices are well suited to the prison environment. Mindfulness training teaches skills that may be very important for prisoners. In particular, it puts the practitioner in touch with their own bodies and feelings. It improves present moment awareness and helps to overcome rumination about the past and negative thinking about the future. It’s been shown to be useful in the treatment of the effects of trauma and attention deficit disorder. It also relieves stress and improves overall health and well-being. Finally, mindfulness training has been shown to be effective in treating depression, anxiety, and anger. It has also been shown to help overcome trauma in male prisoners. Most of the research to date involves adult offenders. 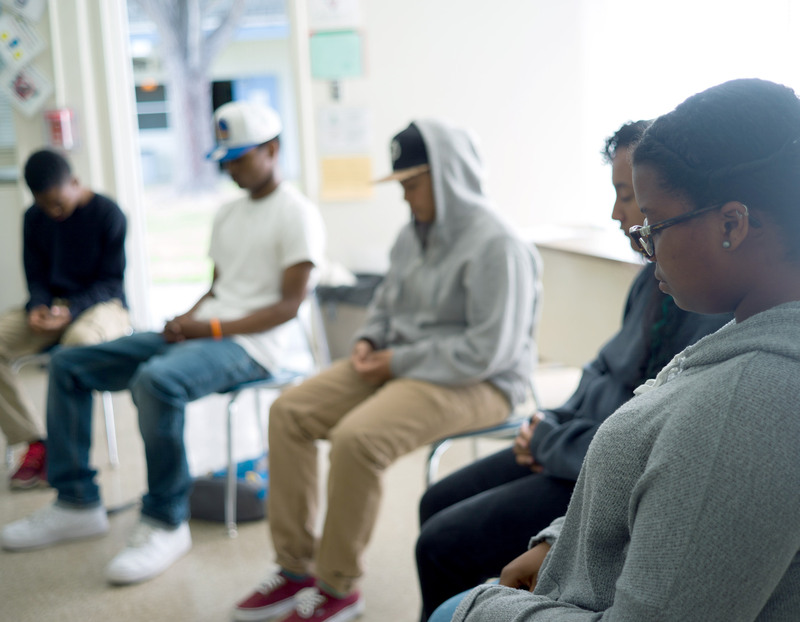 Mindfulness training for juvenile offenders, though, has the potential to change the course of young lives. But, little is known about the effects of mindfulness training on juvenile offenders. In today’s Research News article “Mindfulness-Based Interventions for Young Offenders: a Scoping Review.” (See summary below or view the full text of the study at: https://www.ncbi.nlm.nih.gov/pmc/articles/PMC6153893/ ), Simpson and colleagues review and summarize the published research literature on the effectiveness of mindfulness training for youths involved with the criminal justice system. They found 13 articles, 11 peer reviewed and 2 not, of the effects of mindfulness training on incarcerated youths. They report that the literature found mixed results with some showing significant effects while others failing to reach statistical significance. But, in general, they report that mindfulness training significantly improves emotion regulation, quality of life, and mental well-being, including reductions in stress and anxiety, and significant reductions in criminal propensity in the youths. Self reports by the participants suggested that they feel more relaxed, better able to manage stress, better self-regulatory skills, improved self-awareness and more optimism about future prospects. They also reported improved relationships, valuing kindness shown by the teacher and being part of a supportive environment in which they felt respected and valued. In addition, they reported that the training helped them develop more positive relationships with staff, peers and family; feel more in control; and were better able to cope with difficult feelings and impulses. They especially appreciated being treated with care, respect and humaneness. Hence, although the evidence is mixed the literature in the main suggests that mindfulness training is of great benefit to incarcerated youths, improving mental health and their abilities to cope with their environment and situation, and some suggestion that they would be less likely to commit a future crime. Obviously, more controlled research is needed with larger samples, but the current findings are encouraging and suggest that mindfulness training might contribute to helping turn these youths around in more productive directions. So, improve psychological health of youthful criminal offenders with Mindfulness. Youth offending is a problem worldwide. Young people in the criminal justice system have frequently experienced adverse childhood circumstances, mental health problems, difficulties regulating emotions and poor quality of life. Mindfulness-based interventions can help people manage problems resulting from these experiences, but their usefulness for youth offending populations is not clear. This review evaluated existing evidence for mindfulness-based interventions among such populations. To be included, each study used an intervention with at least one of the three core components of mindfulness-based stress reduction (breath awareness, body awareness, mindful movement) that was delivered to young people in prison or community rehabilitation programs. No restrictions were placed on methods used. Thirteen studies were included: three randomized controlled trials, one controlled trial, three pre-post study designs, three mixed-methods approaches and three qualitative studies. Pooled numbers (n = 842) comprised 99% males aged between 14 and 23. Interventions varied so it was not possible to identify an optimal approach in terms of content, dose or intensity. Studies found some improvement in various measures of mental health, self-regulation, problematic behaviour, substance use, quality of life and criminal propensity. In those studies measuring mindfulness, changes did not reach statistical significance. Qualitative studies reported participants feeling less stressed, better able to concentrate, manage emotions and behaviour, improved social skills and that the interventions were acceptable. Generally low study quality limits the generalizability of these findings. Greater clarity on intervention components and robust mixed-methods evaluation would improve clarity of reporting and better guide future youth offending prevention programs.